The Consulate General of the People’s Republic of China in Los Angeles, Ambassador Liu Jian, and the Richard Nixon Foundation today commemorated the 45th anniversary of President and Mrs. Nixon’s historic trip to the People’s Republic of China, at the invitation of Premier Chou En-lai. The commemoration at the Richard Nixon Presidential Library and Museum occurred exactly 45 years after President Nixon and Premier Chou En-lai issued the Shanghai Communiqué — a new framework for U.S.-China relations following 25 years of no communication between the two countries. The Shanghai Communique continues to serve as the guiding framework for U.S.-China relations today. In attendance at the commemoration were Ambassador Liu Jian, Consul-General of the People’s Republic of China and his wife Mme. Chen Xiaoling; Col. Jack Brennan, former White House Military Aide who accompanied President and Mrs. Nixon to China in February 1972; Bill Baribault, President and CEO of the Richard Nixon Foundation; Michael Ellzey, Director of the Richard Nixon Presidential Library; Dr. James Cavanaugh, Vice Chairman of the Richard Nixon Foundation Board; Christopher Nixon Cox, President and Mrs. Nixon’s grandson and member of the Richard Nixon Foundation Board of Directors and Robert Sun, founder and president of American-Chinese CEO Society. I am grateful of Nixon Foundation for inviting my wife and I to attend this luncheon of celebration. Today we have come to the Nixon Library with feelings of reverence for President Nixon who made great efforts during his presidency to build deeper understanding and friendship between China and US. Friends familiar with the history of China-US relations will come to realize that this month marks the 45th anniversary of President Nixon arriving in China. The first made by an American president was a major step towards opening diplomatic ties between PRC and US. During that visit, the well-known Shanghai communiqué was released, which highlighted principles such as the acknowledgement of One China. This starts the process of the normalization and latter oversaw the establishment of diplomatic ties between China and US, which launched a new era of relations between our two great countries. Though 45 years have passed since the issuing of the Shanghai communiqué, its historical significance has never been worn out over time. The very principles illustrated by the communiqué have always been regarded as the cornerstone of the development of China-US relations. When people look back at history, they can hardly help admiring the then leaders of our two countries for their strategic gut and political wisdom in handling China-US relations at that time. Today when recalling the visit by President Nixon 45 years ago, I should say that visit is one of the few occasions where a visit brought about a seminal change in international affairs. This is one of his most celebrated achievements as president. China will never forget the historical contribution made by President Nixon, an old friend of the Chinese people. In the changing and turbulent world today, while China and the US have generally maintained cooperative relations, major differences of this sort or that still lie in our way. How shall we resolve these differences? How can we establish mutual trust? How do we promote our bilateral relations in a consistent manner? I think the principles and spirit, imbedded with the history of issuing the Shanghai communiqué, may somehow inspire us in one way or another. We know that the significance of China-US relations today goes far beyond bilateral context. 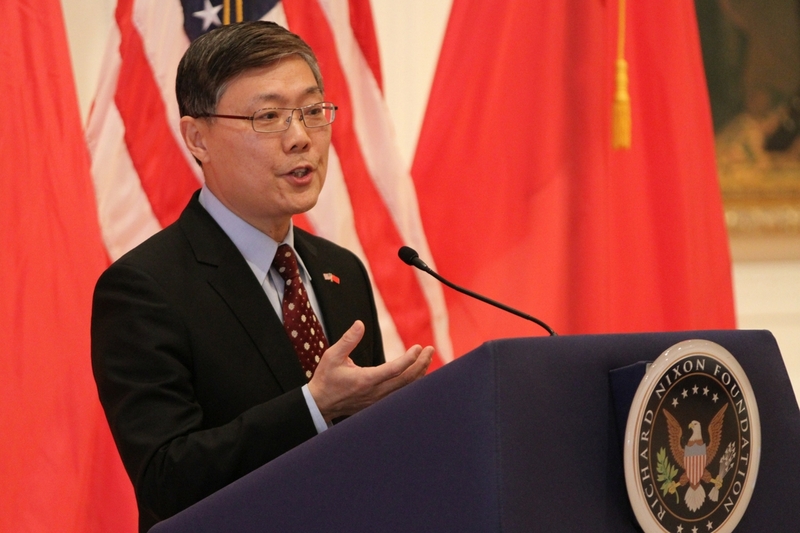 A sound and steady China-US relationship meets the interest and wide aspirations of the international community. Recently we are happy to see that President Xi and President Trump had a very good phone conversation, during which a wide range of topics were covered and One China Policy was reconfirmed. The two sides will work together in the spirit of the phone and strive for new progress in bilateral relations. China attaches great importance to growing its relations with the US. As pointed out by President Xi, China and US shoulder special and important responsibilities and share extensive common interests in safeguarding world peace and stability and promoting global development and prosperity. Cooperation is the only right option for the two countries. China will work with the US in the principle of non-conflict, non-confrontation, mutual respect and win-win cooperation, to manage differences and strive for great achievements in our bilateral relationship by ensuring its healthy and sound growth. As a Chinese saying goes, the fire burns high when everyone brings wood to it. Nixon Library is so strongly committed to a better and stronger relationship between our two counties. We are all grateful of your Foundation for the contribution and unique role in promoting this bilateral relationship. Dr Kissinger wrote in his book World Order and I quote, that each generation will be judged by whether the greatest, most consequential issues of the human condition have been faced. Today we have come once again to a historical juncture. Let us work together to bring about an even better future for China-US relations pioneered by President Nixon and the older generation of the Chinese leadership, and make an even greater contribution to the happiness of our two peoples and the well-being of the people the world over. Last but not least, we just celebrated the Chinese New Year. Here I wish every a very happy new year of the rooster.